Coin terms can be confusing to the novice coin collector and it is important for every new coin collector to learn the meanings of the coin collecting terms most frequently used by coin dealers and other coin collectors. Below you will find the coin terms that are associated with the different coin parts that you will frequently hear when discussing coins and coin collecting with other numismatists. The graphic illustration should help you understand where each coin part is located. You will also find further explanations of the different coin parts below the graphic illustration. Other coin collecting terms are located here. Edge - This is the very outside border of a coin. It can be plain (smooth), reeded, or decorated. It can also be lettered as with the Presidential $1 coins. The edge is sometimes referred to as the 'third side' of a coin. 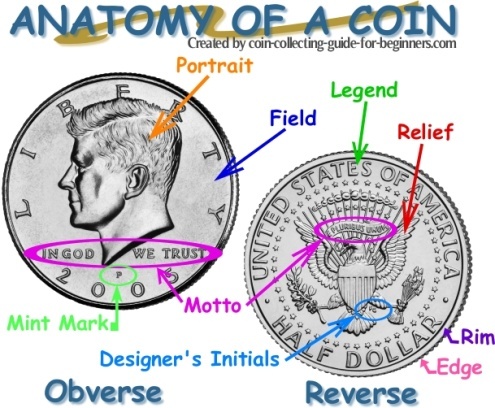 The coin in the illustration above (Kennedy Half Dollar) has a reeded edge. Designer's Initials - The initials of the person who designed the coin are usually on the coin somewhere. Field - This is the flat surface of a coin that is not being used for the design or inscriptions. Legend - Also called the Inscription, this is the main lettering on a coin. Mint Mark - This is a small letter or other symbol that indicates where the coin was minted. Motto - This is special lettering or inscriptions on a coin that have special meanings to the country of origin. Examples on United States coins include "In God We Trust", "Liberty", and "E Pluribus Unim" (Latin for "Out of Many, One"). Obverse - This is the front or heads side of a coin. The Portrait Design and date are usually on this side. Portrait - This is usually the main part of the coin's design. In the United States it is usually a president or LIBERTY. In other countries in could be a king or queen. Relief - This is the part of the coin's design that is raised above the surface. Reverse - The back of a coin. This is the side that we called tails when we were kids. Rim - This is the raised portion on both sides of a coin. It goes all the way around the coin and makes it easier to stack the coins as well as protecting the design from wear. Date - This is the year the coin was released or minted. Learn About Other Coin Collecting Terms.